This is the tomb of the pharaoh who won an empire for his country, and who built a great Festival Temple at Karnak in thanksgiving to Amon-Ra for victory. He chose a remote site in the Valley of the Kings for his tomb. It is approached up a steep ladder that is located at the end of a narrow, rocky ravine. The entrance is high up in the cliff face. From there a sloping corridor leads to a staircase (1) that is flanked by broad niches, another corridor that has a deep pit (now- bridged), and two chambers. The first chamber (2) is of irregular shape. The ceiling, decorated with stars, is supported by two undecorated pillars, and the walls bear the names of 476 different deities and demons of the underworld. The main chamber (3), approached by another stairway, is oval; deliberately cut reminiscent of the shape of the cartouche, and is flanked by side chambers. The mortuary texts on the walls are simple line drawings and citations of the divisions of the underworld. The first of the two pillars is particularly noteworthy. On one face Thutmose III is shown in three registers. At the top he is depicted in a boat with the queen mother, whose name was Isis. She seems to have been of no particular importance, but her son wished to immortalise her by depicting her in his tomb. In the second register he is shown being suckled by the sacred tree that is usually associated with the goddess Nut, but is here associated with the goddess Isis. 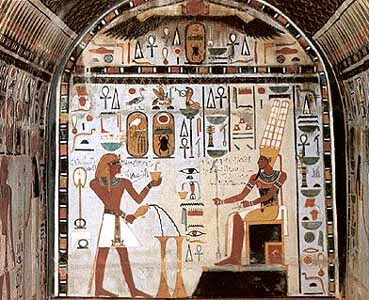 In the third register Thutmose is followed by several female members of the royal family. 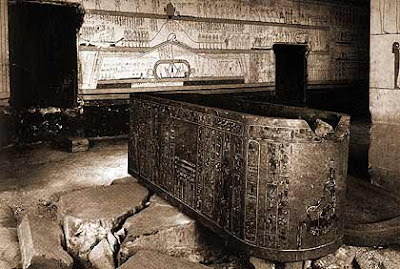 Despite the remoteness of the tomb, and all the precautions taken to safeguard it from tomb robbers, it was robbed in ancient times. The mummy of the pharaoh was left in it and later removed by the priests to the shaft at Deir el Bahri. 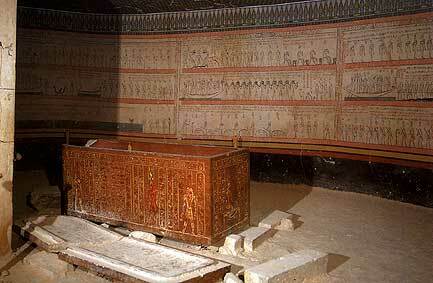 The red sandstone sarcophagus remains in the main chamber with the overthrown lid beside it.